There seems to be a misconception that the "hoodie" was invented two years ago for British yoof to annoy pensioners. That’s not actually true – they’ve been around for years. 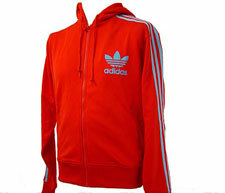 Long enough, in fact, for them to qualify for Adidas’ Originals range – like this Adidas Originals zipped track top. Originally released in the late 70s, it’s made of a flock material and available in a choice of contrasting colours, with the Adidas logo in flock print on the chest.